A football club supporter's group has written an extraordinary letter to a rival club accusing stadium stewards of treating "them like animals" . The claims even include asking women to show their BRAS in an act they compare to 'sexual assault'. In a long letter detailing 'issues of concern', Grimsby Town FC's Mariners Trust wrote to Stevenage FC about the alleged treatment of their supporters during their away visit to the Lamex Stadium on Saturday. 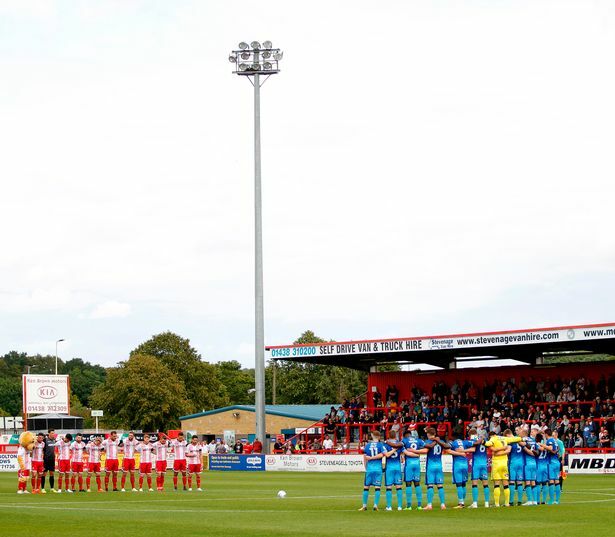 Children as young as five-years-old were said to have been given full-body searches at the Sky Bet League 2 match won by Stevenage 3-1. One youngster was “visibly upset by being searched in this manner”, it was claimed. The treatment was described as "amongst the worst our fans have experienced in decades of travelling across the world to watch football". Mariners fans were left outraged when staff working for the Hertfordshire club asked female fans to "lift their tops up to show their bras" upon entry. "This decision – in the queue in front of other supporters, including men and male stewards – is a gross invasion of privacy," the letter reads. "Female supporters have also since contacted us to state they were asked by female stewards if they could feel their bras if they confirmed that they were underwired." "The supporters were made to feel uncomfortable and when they replied they would ‘rather not’ they were ‘reluctantly’ let in to the ground." "This act would effectively constitute a sexual assault and these types of searches are unlawful." Complaints were also made about the lack of proper washing facilities at the ground - including no soap, drying facilities or hand sanitisers. The Trust added that one supporter “had hand sanitiser removed from their bag during the entry search” - despite this even being permitted on airliners, the Grimsby Telegraph reports. The letter goes on to condemn the “antagonistic attitude” of the stewards at the front of the away stand who are alleged to have “lined up in front of the away supporters sat on the front and second rows, blocking their view of the match”. One female steward was said to be “particularly antagonistic” and made a “fisticuffs gesture to a colleague, suggesting she was actively looking for the opportunity for issues to present themselves”. They added that her actions “could have caused a serious flashpoint” and were “naive and inappropriate”. 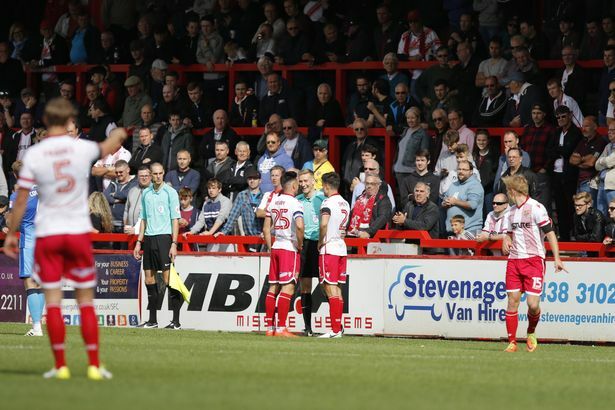 After a backlash on social media, the Trust – which represents more than 3,000 Grimsby Town fans – penned a letter to Stevenage FC urging the club to investigate the conduct of stewards at the game. 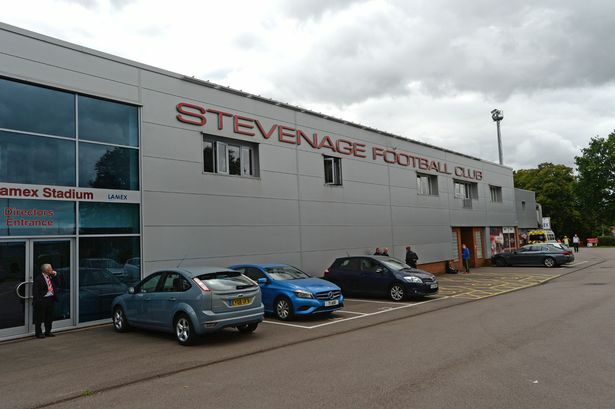 Stevenage FC have now issued a statement from its safety officer. We believe there were a number of serious failings by the stewards inside the Lamex Stadium which we urge you to investigate to ensure that supporters from other clubs are not treated with the same contempt. It is our view that the treatment of Grimsby supporters by your stewards was amongst the worst our fans have experienced in decades of travelling across the world to watch football. We must start this letter by stating we appreciate the need to steward and police football matches in a safe manner and, with current world events, to ensure the safety of all of those at the ground. As supporters we fully understand the need to ensure the safety of all staff and supporters and do not object to a fair search upon entry. Several female supporters were asked to lift their tops up to show their bras to female stewards upon entry to The Lamex Stadium. This decision – in the queue in front of other supporters, including men and male stewards – is a gross invasion of privacy. Female supporters have also since contacted us to state they were asked by female stewards if they could feel their bras if they confirmed that they were underwired. The supporters were made to feel uncomfortable and when they replied they would ‘rather not’ they were ‘reluctantly’ let in to the ground. This act would effectively constitute a sexual assault and these types of searches are unlawful. If deemed necessary, although we cannot see how feeling an underwire in a bra could be deemed so unless acting on previous intelligence, then any fans in question should have been taken to a private area of the ground to be searched by a female steward rather than being searched in full view of male stewards, fans and Police. We are not aware at this stage that any previous intelligence contributed to these types of searches being implemented against female supporters. It must also be stressed that not all supporters were subject to the same search – some supporters were patted down, asked to empty pockets and subject to a metal detector wand. Others – including members of the Mariners Trust Board – were waved straight through without any searches at all. We have also been made aware of full body searches being carried out by stewards on children as young as five years old. Backpacks were searched and they were subject to the same metal detector search by male stewards as the adults. We have been made aware that at least one minor was visibly upset by being searched in this manner. A number of items not on your banned list were also seized by stewards upon entry to the ground. Again we understand the need to keep supporters safe, but amongst the items taken include a tiny bottle of hand sanitiser (which is allowed by law onto an aeroplane), contact lens solution, cough sweets and medication. This over-the-top approach unfortunately set the tone for the rest of the afternoon. Once the match kicked off there were further issues all caused by the stewarding in the away stand. 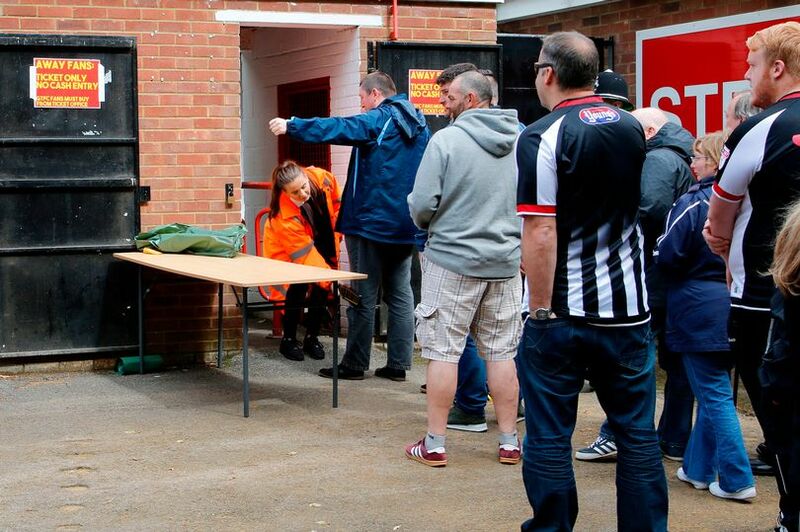 A female steward was posted inside the male toilets near the away turnstiles. 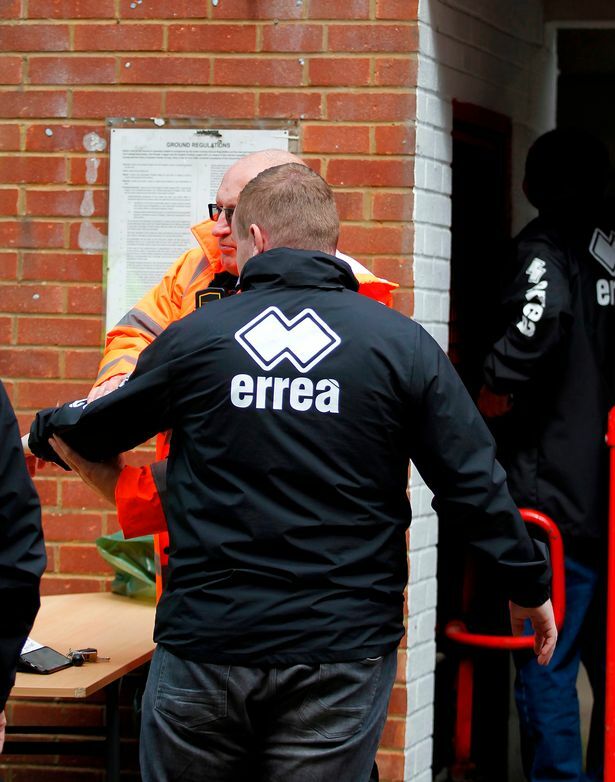 The steward was asked to leave by Grimsby Town supporters, but she refused despite the fact several male stewards and police officers were stood outside. We have been told by Grimsby Town fans that a number of minors used the facilities during this time which we believe raises significant safeguarding issues. We have further been made aware that one male minor was also visibly upset by the presence of a female steward within the male facilities. On top of this, there were no washing facilities in the men’s toilets raising hygiene issues, no soap, drying facilities or hand sanitisers. Indeed one supporter had hand sanitiser removed from their bag during the entry search! We have copied in the licensing authorities at Stevenage Borough Council to make them aware of the significant basic hygiene issues. Significant issues occurred throughout the game due to the antagonistic attitude of the stewards at the front of the away stand. Shortly after kick off a number of stewards – wearing both orange and yellow vests – lined up in front of the away supporters sat on the front and second rows, blocking their view of the match. When supporters questioned the decision to block their view the stewards rudely told them they could move if they couldn’t see. This is contrary to the terms and conditions of sale which very clearly state supporters must sit in the seat named on their ticket. We would suggest it also caused significant obstruction to the view of those sat at the front. They were sold – in good faith – seats with unobstructed views and paid £21 each for the privilege. 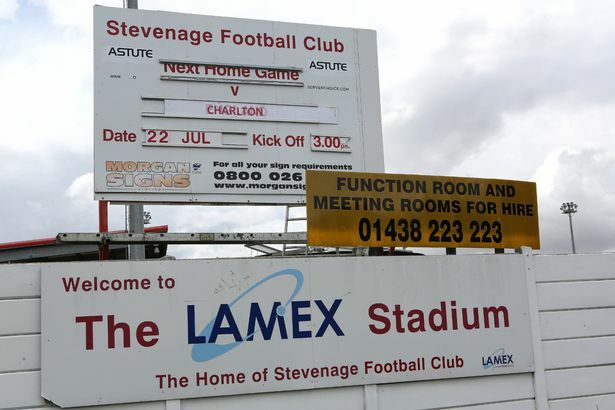 The seats were subsequently mis-sold and we have sent a copy of this letter to Trading Standards at Stevenage Borough Council for them to investigate. We would ask that Stevenage FC consider refunding all those supporters who purchased tickets on the front row as a gesture of goodwill for the unnecessary obstructed views caused by your stewards. Please find attached a photograph of the view which a young Grimsby Town supporter had when several of your stewards stood in front of him for the vast majority of the match. When supporters – including a Mariners Trust board member – asked for the names of the stewards and their superiors they declined to provide them. They also tried to stop supporters taking their photographs to aid in their identification of the stewards in question to enable them to make a complaint, the female steward said supporters didn’t have the right to receive her name or take her photograph! Please find attached photographs of some of the stewards who behaved in a disgraceful manner and who abused their position. It would seem – at the very least – they lacked basic training to be put in the position they faced. The female steward pictured was particularly antagonistic, making a ‘fisticuffs’ gesture to a colleague, suggesting she was actively looking for the opportunity for issues to present themselves. She also mock cheered when Grimsby scored and then made a ‘stirring’ gesture to another colleague immediately after. Her actions – had they been seen by other supporters – could have caused a serious flashpoint. They were naive and inappropriate. Alan Rutter (Former Football Intelligence Officer and England Spotter with over 10 years experience). The letter was posted on the Mariners Trust website here .